As part of the run-up to this year’s Kitschie Awards, the organisers invited me to write a review of one of the shortlisted novels. I was delighted to accept. 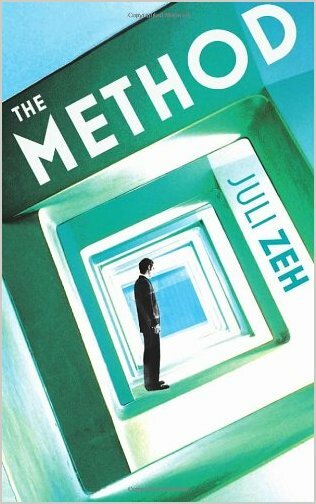 Their selection was Juli Zeh’s The Method, shortlisted for the Red Tentacle Award, and just in time this is my review. At the heart of Juli Zeh’s The Method lies a deceptively simple question: how much personal autonomy are we prepared to surrender for the greater good of achieving a perfectly healthy society? A surprising amount, Zeh suggests; her novel portrays a society which has mostly surrendered its individual freedoms to the greater good. Thanks to following the Method, a system developed by Heinrich Kramer (and I’m sure it is no coincidence that the title suggests a questionable dieting plan), everyone is now fit and well. There is a downside, of course, in the need for constant monitoring in order to maintain this happy state – much of this is achieved through statistics collected via a mandatory microchip implant and through regular check-ups, not to mention monitoring of exercise machines and so forth, but this is surely a small price to pay for good health. But health control goes further than this: no caffeine (hot water enlivened with a few drops of lemon juice substitutes for this), no tobacco, no alcohol (though both substances seem, mysteriously, to be available, as and when necessary) and the wider environment is also controlled and monitored. Parts of the great outdoors are proscribed as being too dangerous. The cleanest, most closely monitored apartment blocks become the epitome for modern living. Yet surveillance goes further than all this in that one is encouraged only to form lasting relationships with the immunologically compatible. Other liaisons occur, although frowned upon, and must be kept quiet (though one would assume that constant monitoring might indicate increased heart rates and so forth). This is clearly a risk-averse society. The question for the reader, then, is whether The Method represents a utopian or dystopian future, but strangely this seems not to be an easy matter to resolve. On the one hand, who would not want a generally healthy society; the attraction of old-style Benthamite utilitarianism underpinning The Method lies in that idea of maximising happiness and reducing suffering. Dystopian anxiety arises only as a result of the way in which that maximum happiness is brought into being. The Method, for all its promises of general well-being through the absence of illness, can only achieve its ends through a deeply intrusive form of social management, the constant gathering of information. What is missing from the Method, is John Stuart Mills’ insight, that there is a distinction to be made between the higher intellectual pleasures and the lower physical pleasures, between happiness and contentment. Thus, on the one side, in Zeh’s novel, we see people like the cleaners in Mia Holle’s apartment block, who find their pleasure in unquestioningly upholding the process of the Method itself, and those, like Mia, who accept the presence of the Method, and are prepared to pay lip service to it, but for whom the Method is not the be-all and end-all of their existence. Mia happily embraces Cartesian duality: her body is a machine made of meat, which she is happy to maintain in such a way as to keep the system happy. Her mind, however, is her own; without material substance it can be of no interest to the state. This, then, is the form of her resistance to the state. She colludes with it on one level in order to avoid notice on another. And this, to some measure, is what we all do; we keep our heads down and keep going. Closer scrutiny suggests that the Method has its problems, not the least of which is the confirmation bias of its founder, Heinrich Kramer. This is made clear to the reader in the way that Mia’s relationship with the state has become unbalanced because of her grief over her brother’ suicide. The Method is built on reason and demands of its participants that they are at all times rational. Mia’s lack of reason, her irrational grief for her brother, her inexplicable desire to withdraw from society and be left alone, pose a threat to the state. The Method has no place for mental imbalance of any kind – presumably because a healthy body leads to a healthy mind. Yet, isn’t grief expressed a healthy mechanism for coping with loss rather than a contagion? Many people will at times in their lives suffer brief periods of depression as a result of life’s events yet Kramer has constructed a system which can see them only as parasites. Mia is, effectively, one such. It is the suicide of her brother, Moritz, which decouples Mia from society. Moritz publicly challenged the Method, although one might wonder just how serious he was in his intent – he smoked, he drank, he went beyond the controlled environment, he used the state-suggested potential marriage partners as little more than unpaid prostitutes and yet one looks in vain for some intent beyond living well as the best revenge. One might ask why Mia Holle is so invested in someone who is, to the reader’s eye, engaged in little more than gesture politics. But that, perhaps, is the point: in a system so heavily monitored, how else can one put the message across? On the other hand, might it not be that Moritz Holle just enjoyed a good time? In truth, his most political act is his suicide, the moment when he recognises what personal freedom actually means. In the Method, there is simply no room for Mia to grieve in the way she would like to, withdrawing from society for a period in order to come to terms with her loss. It is her desire to do so which brings her into conflict with legislators and with Heinrich Kramer himself. Accompanying her through this is the Ideal Inamorata, a figure, an idea, bequeathed to her by her brother, or perhaps a sign of her own madness; either way, the Ideal Inamorata becomes her sparring partner in a series of intense discussions with lawyers and judges. Mia slowly comes to understand that Kramer now needs to test his own system, to find out how well it works, and that Mia, by refusing his system, will act as that test. There is no certain ending to this novel. We are left with Mia stripped of her protection, struggling to become the freedom fighter her brother saw himself as, ill-equipped to deal with a system that is so overwhelming. Exercise of personal autonomy is not enough in a system in which most people are entirely happy with the status quo. One is constantly struck by the way in which Mia becomes the tool of others whose personal agendas are more clearly defined than her own, which is merely to survive, as well as by the fragility of a world in which health is paramount yet the black market works well in delivering tobacco and alcohol to those who want it, suggesting in turn that the Method is little more than a facade itself. It’s always difficult to find pleasure in the dystopian without an upbeat resolution to look forward, and some may consider this the case with The Method. Yet, I’d argue that this really is not what the novel is meant to be about. Zeh is not seeking restoration or a new beginning so much as she is laying out the arguments for and against – and both are persuasive. This has always been the problem with forms of utilitarianism: as a philosophy it is deeply seductive, so long as it conforms with one’s own view of what happiness entails. But happiness takes so many different forms. At a point when some American state legislatures are curtailing women’s reproductive rights to the point where they are trying to insist that all women of childbearing age keep themselves in a state of healthy readiness in case they become pregnant, and where the British government is seriously considering restricting access to some medical procedures for those who are overweight, heavy smokers or drinkers, on the grounds that they haven’t demonstrated sufficient desire to maintain their health, Zeh’s novel presents powerful arguments against a system that simply doesn’t allow for humans to be … well, human. If you’re looking for a utopian happy-ever-after, this is almost certainly not the novel for you. However, if you like novels that are intensely argued and which step beyond the conventional rhetoric of the dystopia, The Method is undoubtedly worth considering. The language and the writing are both very plain, and the whole thing is intricately constructed, with a constant to-ing and fro-ing of argument, examining the issue from all sides. Indeed, this is one of the things I most like about it, that it doesn’t slavishly follow one viewpoint but instead constantly tests the ideas under discussion. It may be low-key but I think it tackles important issues in a way that feels more plausible and convincing than some novels with what one might call high-production values. So far it seems to have received little attention in the English-language press and what notice it has received has tended to default to an easy designation of it as a dystopian novel, but I’d argue that there is rather more than that to The Method. This entry was posted in Uncategorized on February 25, 2013 by maureenkspeller. I enjoyed and appreciated your review, Maureen. I have just finished reading this book,(I see shades of Orwell and Huxley) before your review, and think your summary is helpful, perceptive and accurate. I have also read "Dark Matter", with its handling of natural philosophy, and can recommend it. "Eagles and Angels" is an earlier book, vividly written, in its way,dealing with some legal and political themes, and with a particularly repulsive protagonist,whose real identity (if any) intrigues me, since the setting, to some extent, has been Juli Zeh's own professional environment ! As far as I know, these three are the only titles which have been translated into English, so I am reading more of her in Dutch translation. Hi John, many thanks for the kind comments, and also for your observations on Juli Zeh's other novels. I'd not realised there were any other titles available in English so off to the bookstore for me. I find her work very intriguing.